Real pearl between the beautiful towns of Amalfi Coast, Positano has been called the “vertical city“. 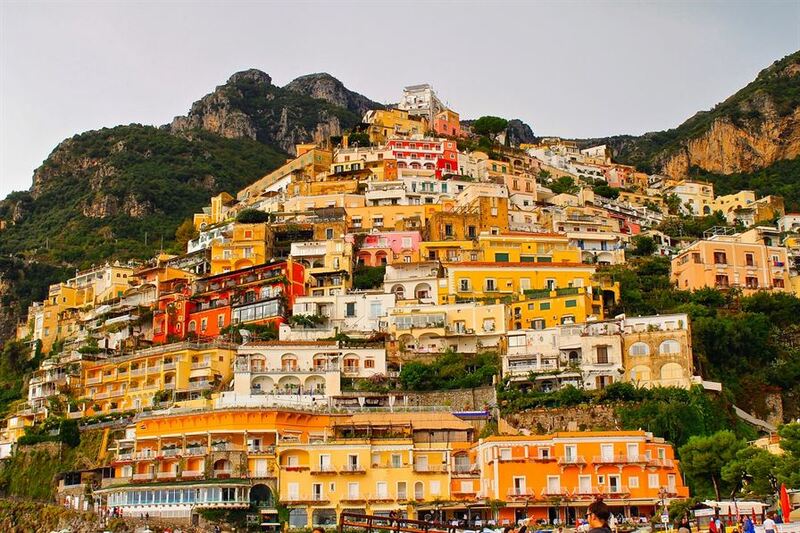 This definition was confirmed by the introduction of Positano in the ranking of the 8 most sloping cities in the world. The city faces the sea, in fact, climbing steeply to the rocky walls of Sant’Angelo a Tre Pizzi mount, between gardens, terraces and steps, in the green of the lemon trees and fragrant plants. Its winding streets seem almost collapsing in the blue waters under the city. Due to its location perched on a hill facing the sea, Positano has been defined the Italian Montecarlo. But unlike the cities of the principality, what makes it unique Positano on the international scene, it’s the charming harmony of the sparkling sea colors, pastel houses, the colorful boutiques, the gardens in bloom and the sun shining for most of the year. Thousands of tourists every year, especially in spring and summer, come from all over the world to admire the beauty of this small coastal city. The hospitality of the people, the lovely atmosphere, the smell of citrus and sea in the air, the breathtaking views, the sound of waves, make your stay unforgettable. Fascinating as the islands of Santorini and Capri, known worldwide for their charm, Positano at the same time develops into a small charming village on a human scale and allows you to reach in a few minutes many wonderful coastal resorts (Ravello, Amalfi, Sorrent,…) by car, bus or for an exciting motorcycle tours on its winding roads. Villa Fiorentino, thanks to its privileged location, allows you to enjoy the beauties that the “vertical city” of Positano offers to the eye. From the terraces of its apartments and suites it is in fact possible to comfortably enjoy the blueness of the sea, interrupted only by the heavenly archipelago of “Li Galli”, the populated beaches and exclusive bays, looking up the alleys and the streets become a picturesque maze, full of boutiques, tailors, artisans shops and art gallerie. Through the beautiful tiled dome of the medieval church of Santa Maria Assunta, we reach the top of the mountain overlooking the city between porches, loggias, gardens and citrus groves. Positano, therefore, vertical city like Lisbon, Budapest, Rio de Janeiro and Los Angeles, but with the typical flair of the southern Italian city, welcoming, hospitable, and rich in history and flavors. Honeymoon, where? Amalfi Coast, the most romantic.